If your regular visits to your local library are becoming more difficult or impossible because of illness, disability, mobility problems or caring responsibilities (including young carers) then consider using our Library Direct service. If no one is available to borrow books on your behalf the Library Direct Home Service can help. We provide friendly volunteers checked by the Disclosure and Barring Service (DBS) to deliver books to those that are unable to get into a library themselves. We can arrange for books and audio material to be brought to you on a regular basis by a volunteer. Our volunteers will select books and audio books based on your recommendations, favourite authors and reading preferences. We have a good selection of books in large print as well as standard print. We stock a large range of talking CDs which can be played on a standard machine. If you are interested in registering for this service please contact Surrey Libraries Information Service who will be able to register you over the phone or alternatively send the forms out to you. We also accept clients from residents living in sheltered accommodation. Have you a few hours to spare, and would you like to help people who can't get to the library? 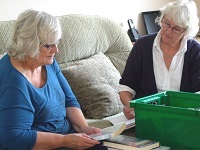 Find out how to become a Library Direct Home Service delivery volunteer. Select and Collect is for when the community setting can provide a staff member or one of their own volunteers to choose library resources for their residents from selected libraries. Due to stock levels we are unable to offer this service from all libraries. Library Direct Volunteers is when two volunteers provided by Library Direct are able to visit the 'setting' on a regular basis and choose and select library resources on their behalf. This volunteer-delivered service tends to happen in a group setting on a monthly basis and is often referred to as the 'library morning or afternoon'. Due to stock levels we are unable to offer this service from all libraries. Book Collection is when we provide a selection of stock on a quarterly basis which the community setting collects from the library, this is often the preferred method for long term patient wards due to the turnover in patients. If you are interested in receiving the Library Direct Community Settings please contact Surrey Libraries Information Service who will put you in touch with the team organising this service. We have also recently introduced a new category of membership, Open Ticket. Facilities available in the library to support you.